Last week, I posted about how using appliqué was one way to make your scenic backdrop stand out. However, why not take it a step further and choose a Mixed Media Backdrop? A Mixed Media Backdrop starts out as a regular backdrop – generally constructed of regular fabric or of digitally printed fabric – but by adding a variety of disparate elements, from appliqués to cut outs to lights, the backdrop is taken to another level. On the simplest level, a Mixed Media Backdrop can be created by simply cutting out certain areas of the backdrop and inserting another fabric behind. 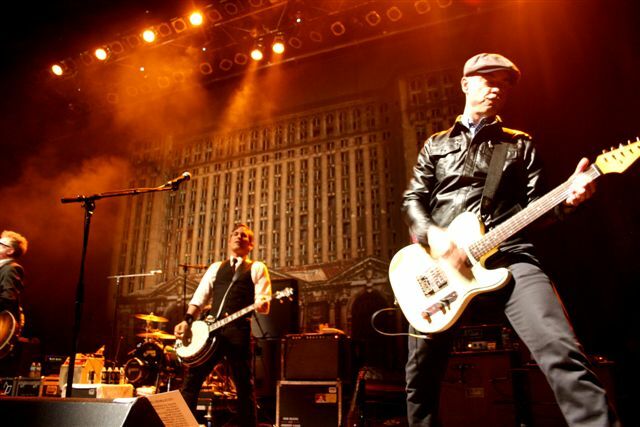 For Flogging Molly, we started by printing the image onto fabric, then cut out the windows and inserted Black Sharkstooth Scrim behind them. Under backlight the windows glowed, but as a front lit piece the gray tone palate gave a wonderful bold but multi-tasking surface. This backdrop for Lady Gaga is a great example of a Mixed Media Backdrop, with its use of so many different elements. Starting out as a digitally printed piece, the backdrop was cut out in strategic locations, with mesh placed behind the cut outs to add dimension. Hidden smoke lines added live exhaust to the city skyline and a front projection screen build into the graphic brought the printed billboard to life. Over 200 LED lights were hardwired to illuminate “the fame machine” sign giving this custom piece lots of interest and dramatically framing the stage. A dramatic backdrop for a dynamic artist! A Mixed Media Backdrop doesn’t have to be a traditional flat piece, either. 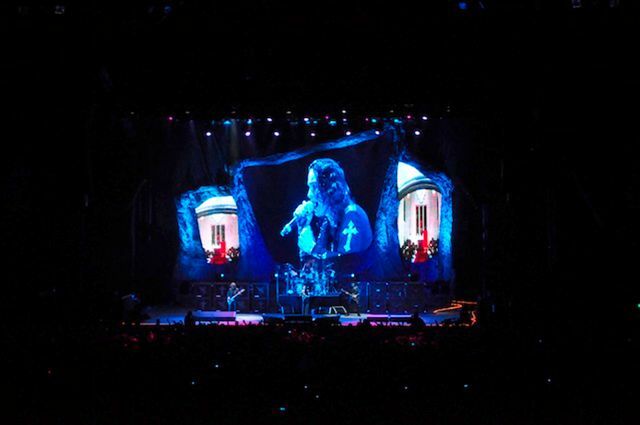 This piece for Black Sabbath has incredible depth and dimension. To get the lava effect, we created a cut drop from Commando Cloth and then used metal mesh for the lava appliqué. To complete the effect, we added scrim to the cutouts. Projection screens were inserted onsite to complete the effect. As you see, there are so many ways that you can enhance your backdrop to make it even more spectactular! We love working on projects like this – if you can dream it, we can do it! We always love seeing firsthand how our clients decide to use drapery, lighting, and of course event design to help create the exact mood (or moods!) that they are envisioning, and having our drapes be a part of it is always very exciting! Recently, one of our amazing clients LG Productions were responsible for creating a spectacular design for the Opening Night Gala of renowned play Orphan Of Zhao at the La Jolla Playhouse (running through August 3rd). Starring B.D. Wong, and featuring an array of Hollywood actors, directors, and producers, this was a special event that the entire San Diego community came out to help celebrate! 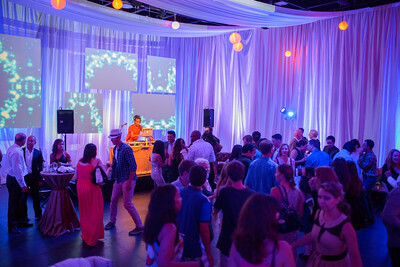 With lighting design by talented designer Luke Gulley, and concept and event design creatively carried out by Luke Gulley and Rachael Terrones, they wanted to give the huge space in this facility an atmosphere of simple elegance. But they still wanted to quickly and easily be able to create a different mood and feel during the many segments of the soiree. 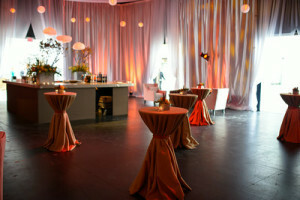 Starting with dozens of white pipe and drape panels, they were able to drape the walls around the entire facility to help get the exact ambience that they were looking for. You can see how Luke and Rachael were able to create different feels to each section of the room by simply splashing different colored theatrical lighting on them, helping give each area its own individual look. Photographed beautifully by Daniel Norwood, we were thrilled to see how breathtaking the space ended up looking. We truly enjoy working with LG Productions on all of their brilliant event designs, and we were especially proud to have been a part of this special gala, too. Want a similar look for your event? Rent What? has a huge inventory of white draping available for rent, that can be a fantastic way to “cover” existing wall decorations or “mask” areas that want to be transformed into your special event’s unique feel. We have everything from sheer White Voile to creamy White Supervel, and our white drapery reflects light like a dream! When most people hear the term “backdrop,” they think of either a simple fabric backdrop or a scenic backdrop (digitally printed or hand-painted). But there are many interesting and dramatic ways to create a backdrop that dazzles, using a variety of combinations of interesting materials and techniques. The technique of appliqué, utilizing a variety of materials, is a great way to make a backdrop stand out from the crowd. An appliquéd backdrop may consist of a design created from one fabric sewn onto a backdrop made of a different fabric, or it may include several different elements, including digitally printed elements, fabric in various colors, and trim. The appliqué may even be padded to add dimension and texture. By appliquéing reflective materials onto a black background, the design shimmers under stage lighting, while the background recedes, making the design appear to float. 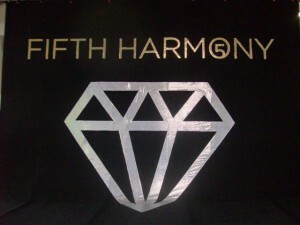 The design may even seem to change color, depending on the specific reflective fabric used as well as the stage lighting. On this backdrop custom-made for the band Fifth Harmony, metallic iridescent fabric in gold and silver were painstakingly cut and sewn onto a flat backdrop of Black 22oz Encore. 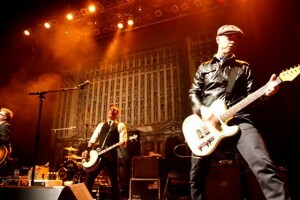 A similar technique was used for this backdrop for Panic at the Disco. Once again, Black 22oz Encore serves as the main backdrop material. In this case, however, a fabric consisting of pearlescent mylar squares on a fabric backing was chosen as the appliqué material. This allows the design to look beautiful under regular white stage lights, but to also appear to change color when hit with colored lights. While the term “appliqué” is usually defined as sewing one fabric onto another, in reality, appliqué isn’t limited to either fabric or sewing. To liven up a digitally printed scenic backdrop, consider attaching a variety of appliquéd materials, including fabric, vinyl, and crystals or rhinestones. This digitally printed backdrop for Jackson Guthy, with its brightly colored design, makes a statement on its own. However, the appliqués of various materials in strategic locations, including mirror vinyl, neon vinyl, sequins, and acrylic crystals, subtly draw the eye to different areas of the design. With a design that prominently featured a diamond motif, this digitally printed and appliquéd backdrop for Jennifer Lopez needed to shine. Printing the design onto a satin material specifically intended as a digital substrate was a great choice, as the material added a sheen not seen with most digital substrates, but more bling was needed. The addition of appliquéd sections of Silver Boucle, along with hundreds of rhinestones painstakingly applied by hand, brought this drape to the next level. When the lights hit it onstage, it brought the dramatic sparkle that the artist was looking for. As you see, applique is a great way to add texture, shine and dimension to a backdrop – whether you are starting with a simple black backdrop or a digitally printed one. After publishing yesterday’s post on Kabukis and Sniffers, it occurred to me that, although we have posted a number of times over the years on Kabukis, the major focus has been on the Kabuki Drape, with just a little information given on the hardware that makes the kabuki trick work – solenoid systems. So today I thought I’d explain solenoid systems in more detail, and include diagrams as well. I’ll explain both a Single Drop system and a Double Drop system, with both examples being used with a 40′ wide Kabuki Drape. For a single drop system, one set of solenoid heads is needed. The number of heads required is based on the width of the kabuki drape to be hung as well as the specific solenoid system used, but typically 1 head is required for every 4′ to 5′ of drapery width. So, in the diagram above, 10 heads are used for a 40′ wide drape. The solenoid heads are attached together with a short XLR cable (in this case, a 5′ cable) between each head. At one end, a long XLR cable (in this case, 100′) is attached to the solenoid head. That long cable goes down to the stage floor to be connected to a power supply box, which is then connected via an Edison cable to a power outlet off-stage. A manual remote box is also attached to the power supply. On the remote is the “button” that, when pushed, retracts the pins on the solenoid heads. When the button is pushed, the backdrop drops to the stage floor. For a double drop system, two sets of solenoid heads (or twice the number as on a single drop) are needed. In this case, for a 40′ wide Kabuki Drape, 2 sets of 10 heads each (20 heads in total) are used. Generally, the two sets of solenoid heads are hung in separate rows on the same truss – one set on the front of the truss and the other set on the back of the truss. On each set, the solenoid heads are daisy-chained together but are not connected to the other set. This is because the two sets will be operated separately – one set for the first drop and one set for the second drop. For the same reason, the two sets of solenoid heads are connected to the power supply box by separate long XLR cables. These XLR cables plug into separate slots on the power supply. A 2-way remote box is then connected to the power supply. The two release buttons on the 2-way remote box correspond to the XLR slots on the power supply, meaning that the push of one of the buttons will send the release signal to one set of solenoid heads and the push of the other button sends the release signal to the other set of solenoids. Typically, the D-rings on the top of the kabuki drape are hung on the back set of solenoids, while the D-rings on the bottom of the attached diaper are hung on the front set of solenoids. Initially, the drape is suspended in the air just under the truss, enveloped in the diaper like a sling. The front set of solenoids is fired first, dropping the bottom of the diaper and allowing the backdrop to unfurl and be revealed to the audience. When the back set is fired, the backdrop drops to the stage floor. To me, the drama of the kabuki reveal is one of the most exciting bits of concert stage magic – and the addition of a sniffer ups the drama even more. Though we have posted before on kabukis, we have neglected sniffers a little. So today I thought I would do a refresher on kabukis – what they are and how they work – along with telling you about sniffer drapes. 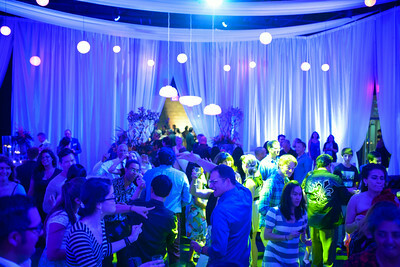 What it is: A Kabuki Backdrop can be just about any type of backdrop – plain or digitally printed, small or large. The primary factor that distinguishes a Kabuki Backdrop from a regular backdrop is the presence of D-rings on the top edge (either sewn on or attached via Velcro). How it works: The kabuki effect works on a simple principle – the use of electrically-powered magnetic systems called solenoids. A solenoid resembles a small box with a pin sticking out. A series of small solenoid boxes are attached in a daisy-chain row on a truss. At one end, this chain of solenoids is plugged into electricity and attached to a controller switch. The Kabuki Backdrop is hung on the solenoid pins via the D-rings. When the time comes, the crew pushes a switch. The switch causes the pins to retract and, as a result, the pins release the D-rings. The Kabuki Backdrop then falls. The two types of kabuki: A single kabuki utilizes one set of solenoids. The backdrop starts out hanging in full view of the audience, blocking the view of whatever lies behind it on the stage. When the solenoids are fired, the kabuki backdrop drops to the floor, revealing the scene behind. A double kabuki utilizes two sets of solenoids, as well as a fabric “diaper.” The diaper suspends the kabuki drape high above the stage, using two sets of solenoids. When the first set of solenoids is fired, the bottom of the backdrop drops to the stage floor, revealing the backdrop to the audience. When the second set of solenoids is fired, the kabuki drape (and the diaper) drops to the stage floor. What is it: A Sniffer Drape starts out as a single kabuki drape made of a very lightweight fabric, such as Poly Silk. In addition to the top D-rings (which allow it to kabuki), the sniffer also has an additional sewn-in and reinforced D-ring, usually sewn in the center of the drape. 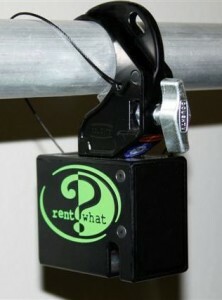 How it works: Attached to the truss is a special sniffer mechanism (which looks like a large box with a tube attached). A nearly invisible line, attached to the sniffer D-ring on the Sniffer Drape, is threaded up through the tube of a sniffer mechanism (which is usually attached to the truss). Nearly simultaneously, the solenoids are fired, the kabuki drops toward the stage floor, and the sniffer mechanism pulls the drape up and into the tube. Did you catch the section of the video above showing the sniffer drape in action? Isn’t it amazing that such a large drape can fit into a small tube? Well, now you understand why a sniffer drape has to be made of a very lightweight material! So, the next time you are at a concert and a backdrop suddenly appears – or disappears – the chances are that you have just seen a kabuki drape or sniffer in action!